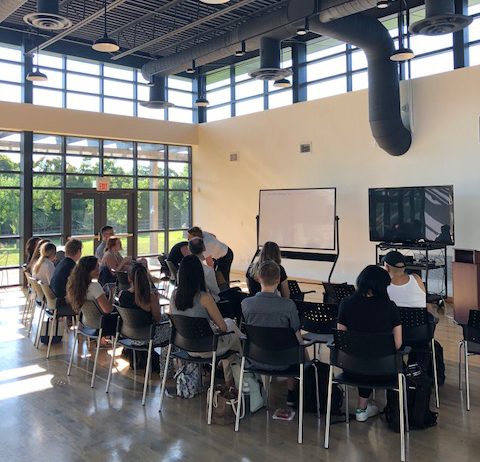 Students from the Ontario College of Art and Design University (OCAD U) met at the Canadian Film Centre (CFC) to start mapping their projects for OCAD U’s Graduate Program in Digital Futures. The program offers masters’ degrees (MA, MDes and MFA) and operates a partnership between OCAD U and CFC Media Lab. The program goal: to respond to the increasingly important and sophisticated role of digital technology as a catalyst for change. The goal for this first intensive? A working prototype to hit the ground running. Digital Futures has been in operation at OCAD U for 10 years, with many recent graduates garnering national and international interest. As was evident at this opening intensive, the program takes a student-centred and peer-focussed learning approach through collaborative group work. Diversity breeds innovation: Here, diversity refers to more than one’s cultural, lived experience and identity. It also references a breadth or diversity in thinking, points of view, approaches, disciplines and domains of expertise. Building personal leadership skills: Given that much of the program is collaborative in nature, students must learn to manage both themselves and their teams. The strength of any collaboration will depend on the strength of the individual’s own relationship to themselves. Innovation is idea-driven: Too often, we focus on technologies as the source of and inspiration for innovation. By contrast, this program focuses on idea-driven innovation; the objective is to focus on meaning, key messages and solutions to problems. Very Frustrating Mexican Removal, by Fusun Uzun. This thesis project examines the Canadian immigration detention system through an immersive, interactive artwork. It employs the practice of Verbatim Theatre and the techniques and technologies of 360° Cinema to present the events surrounding the death in 2013 of migrant Lucia Vega Jimenez while in detention with the Canada Border Services Agency. It’s the little things that matter, by Ling Ding. Informed by democratization in material and digital design and inspired by the practice of enchanted objects, Ding’s thesis project, SMARTKIT, is a hacking toolkit. It allows individuals with little hacking ability to enchant the ordinary functionality of home furnishings and endow them with new capabilities, ones that provide personal and social services that monitor and manage home consumables. Emilia, by Marcelo M. Luft. For many elder adults, the aging process is challenging, rife with social isolation that leads to depression and loneliness. This thesis project uses a research-through-design methodology to investigate and reflect on the application of the concepts of Ambiguity, Tangible User Interfaces and Calm Technology in mitigating loneliness. Its prototype, “The Happy Box,” consists of a pair of internet-connected boxes that aims to support connectedness and affective awareness through non-verbal intimate and tangible interaction between elder adults and their family and friends. By blending art, activism and digital media, the Digital Futures program focuses on practice-based learning and prototyping, with an enterprise component, industry partnerships and supporting thesis research. It features collaborative overseas global courses with worldwide educational and industry partners, and appeals to people with a background in design, technology, culture and/or enterprise. Students are designers and artists, filmmakers, architects, journalists and media specialists, scientists, engineers and business people – a diversity that will no doubt drive peer learning and collaboration across the heterogeneous disciplines that make up the backgrounds of these 19 people. 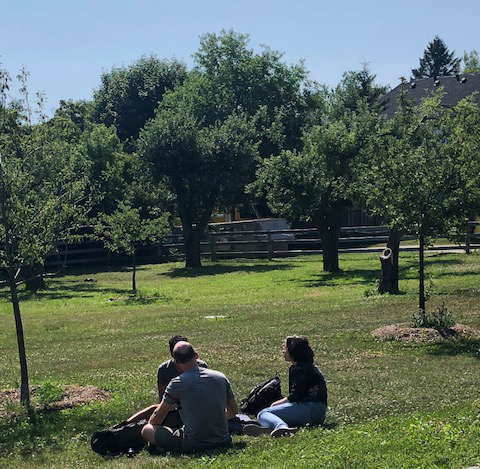 We at the CFC are excited to see what final projects emerge out of these exploratory peer-based sessions over the summer, as well as during the upcoming 2018-2019 school year, and culminating in the annual graduating exhibition each April.